Sorry guys, been under the weather the last few days so here are my closing thoughts on our trip. The first thing you notice as you pull in is all the cars, we arrived at about 9:30 and there appeared to be a couple of hundred cars already and this was on a Thursday...I can't imagine what it looks like on a weekend. Next we had to sign in and pay and this place isn't like your local course where you just walk into the pro shop and pay. This place had this special section where there were two lines...one for players with a reservation and another for those that didn't. Luckily we had a reservation so we got through there pretty quickly. The weird part is the people you're giving your money to are sitting behind glass partitions that appeared to be two inches thick...it reminded me of a horse track or a casino. We then had an hour or so to kill so we hit the driving range, or what I'll call the "iron range", yep we went to the driving range where you're not allowed to hit your driver. The driving range was pretty small and has a weird set up, you hit from an elevated position down into this giant bowl and you could see why a driver wasn't allowed as there was a fence about 250yrds out and a road just on the other side of the fence. Next we were off to play some golf and all I can say is the course was beautiful, it is really hard to believe that this is a public golf course. The fairways were plush and the greens were perfect. After the round was over we hit the pro shop and bought some gifts. Unfortunately Lou had to take off soon thereafter, but Erik, David and I hung around for a couple of drinks. 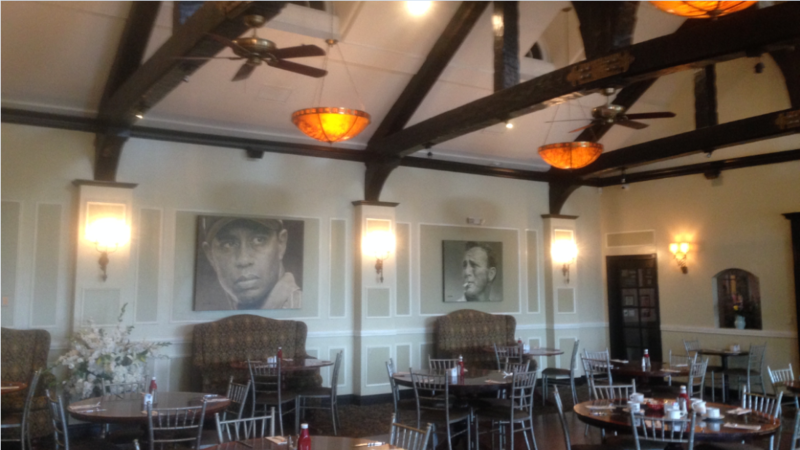 We also had time to check out the clubhouse which is covered with all kinds of memorabilia. 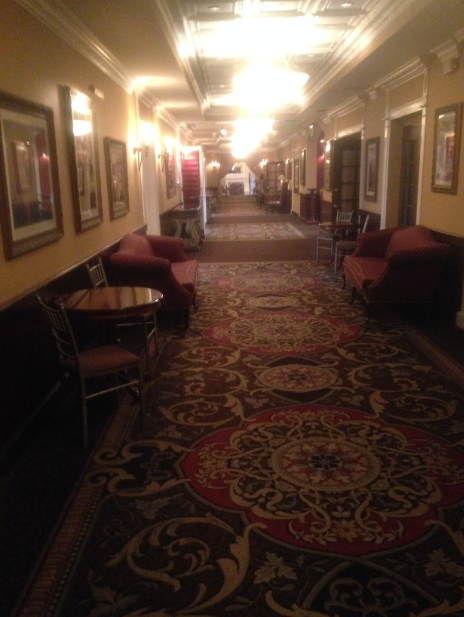 As stated in a previous post, the hallways of the place reminded me of "The Shining". In closing, Lou, Erik and I are definitely going to do this again and we hope Fuzzygazz can join us on the next trip as he wasn't able to join us this time. 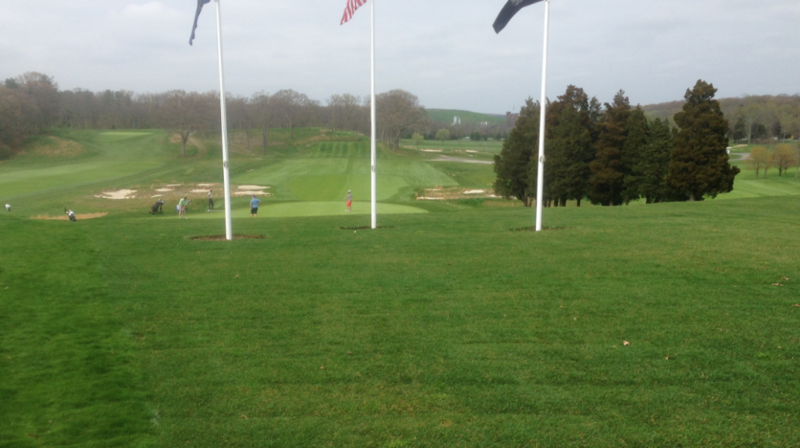 Also, I extend an open invitation to mystry78 to join us next time which might be this Fall at this course Fox Hopyard, and I only suggest this course as this is where we wanted to play last year but on the date we picked they were having a big tournament that day so we chose someplace else to play. Anyone else out there that wants to get together and play...we're are certainly open to suggestions, Fox Hopyard isn't a done deal. PS- Bubbs, I hope you play golf IRL because you have a gift coming your way. Fantastic write up mate and those pics look great. Lot of history flowing through the place by the looks of it. That driving range seems strange i must admit as you would think a course of that stature would need one but i suppose when you see pros warming up they generally in another open field, not really a range how we know it. As per message mate, thanks so much and i will post the pic on here. A truly sensational read, and epitomises why this is a great game.....a game made up of some top people that sadly we will often not meet in real life, but the type of people you know you could have a beer or a coffee and talk for hours. I have only met one person from WGT.....played a roud of golf and pretty much solved all the worlds problems when we were at the 19th..........sadly....in the cold light of day (in other words...being sober) they were a little flawed! I have played a couple of the WGT in real life.....but well before I discovered this game....and was one reason I started playing this game. Thanks for the great read Wayne. A couple of years ago a few members of the Deviations CC ( lvietri, fuzzygazz & beachedmulligan) were getting together to play IRL and they asked me to join them, which I did. 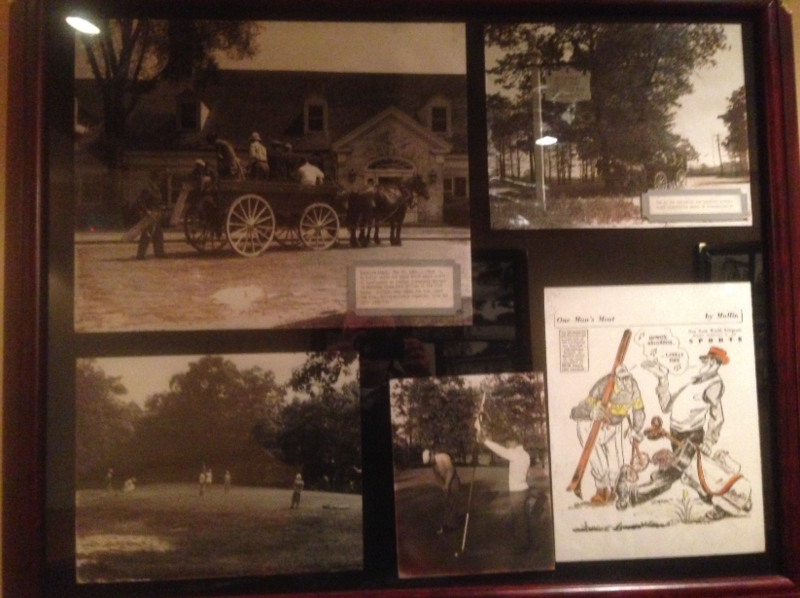 We played at Casperkill Golf Club in upstate NY and we all got along great and had lots of fun. 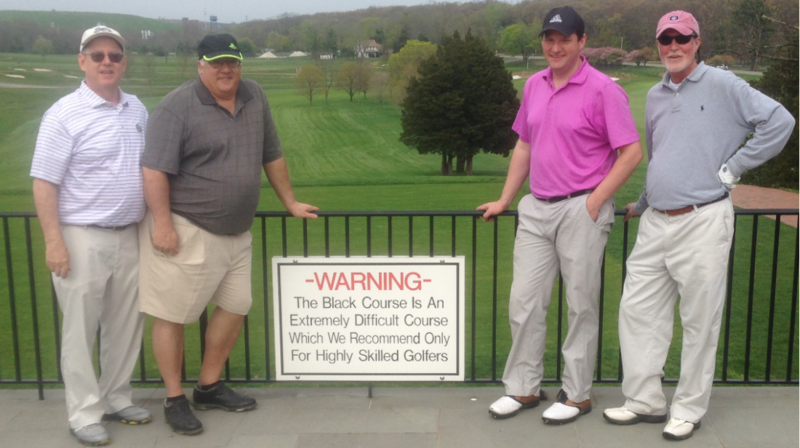 Last year we decided to do it again, but BM had moved away, so we invited my friend/co-worker eingmund to join us and this time we played at Great River Golf Club in Connecticut and once again we had a blast. We all wanted to get together again and this year we decided on Bethpage. We quickly realized that as much as we'd like to play the Black course, we didn't really feel like carrying our bags all over that course (as they don't allow golf carts) so we settled on the Red course ( for those of you that don't know, Bethpage is a New York State Public Park consisting of five courses- Black, Red, Blue, Yellow & Green) and the Red course is supposed to be the second most difficult course next to Black. Unfortunately Fuzzy wasn't able to join us this year so Lou (lvietri) asked his friend David to join us as he was just 20 mins from the course. This picture doesn't do it justice, but it was pretty impressive. The halls of the clubhouse reminded me of something out of the movie "The Shining". Erik (eingmund) and I showed up next after getting lost in a funeral procession, but we made it. David showed up shortly thereafter and we checked in and then we all hit the driving range before we had to tee off. We then teed off about 20 mins early and all I can say is WE HAD A BLAST! There was a heavy fog as we teed off but it seemed to burn off at the turn and the sun came out. David played great golf and Lou was a close second. I hit my drives like there was no tomorrow but my short game failed me and unfortunately Erik was just having a bad day. David won the day! The whole place was incredible to look at and the fairways and greens were perfect, it was amazing!! I would definitely play there again with these guys! 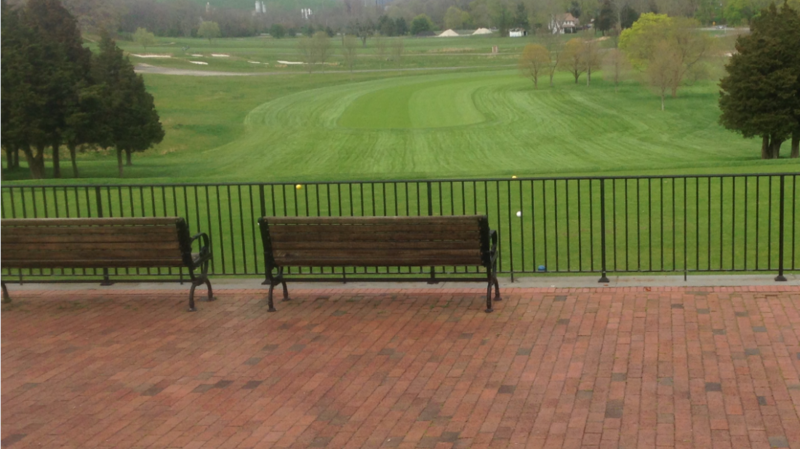 Here is a shot from behind the 18th green from the clubhouse looking out to the tee box. Off to the left is the Red course #1 and off to the right is the Black course #1. Here is a tribute to A.W. 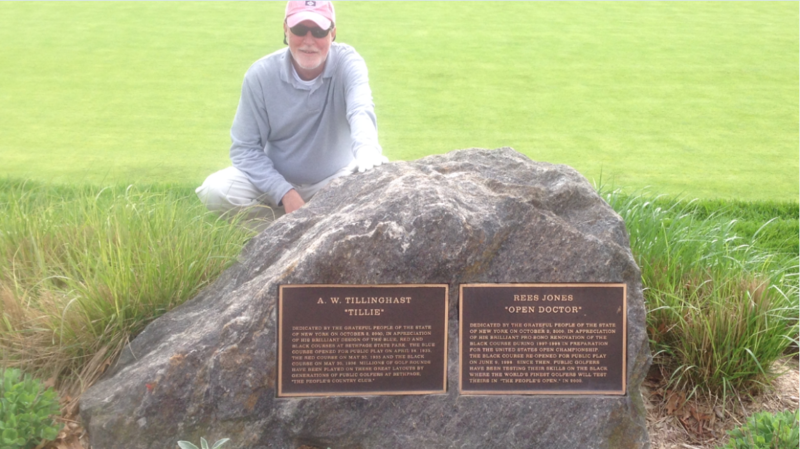 Tillinghast the original course designer and Rees Jones. A.W. 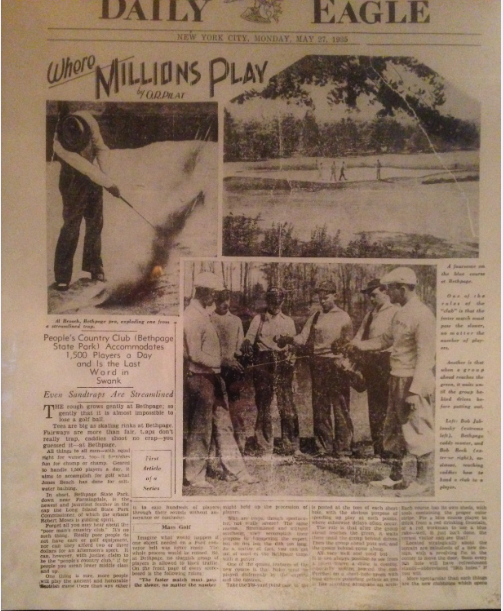 Tillinghast originally designed the course and Rees Jones redesigned it to welcome the first US Open at a public golf course. I'm exhausted, I'll fill you in on more details this weekend. PS- I'll be sending out a gift from the Bethpage pro shop to someone that responds to this post. who's that ugly guy in the pink hat ? Well Wayne, after days of us chatting and tracking it got here from over the pond my friend. To have something from that course is quite something, a treasure i would never have a chance to have. Hoping to be back on the course soon and lets hope its my new lucky marker. Wellser, now, that is just too cool fer school, an' that's all I gots to say. Absolutely awesome Wayne, That say`s it all my friend...! You're very welcome Bubbs...it was my pleasure. You know, you might be on to something with the lucky marker thing because I actually bought that same marker for myself and last Thursday I clipped it on my hat and played a quick nine after work with some co-workers and I did something I have never done in all the years I've been playing golf. On the third hole, from about 10-15 yards off the green, I chipped up and BANG...the ball hits the pin and drops right into the cup!!! But wait, it gets better...two holes later on the fifth...I did the exact same thing again!!! Two chip-ins in nine holes, I've never done that before. So, I hope it brings you the same luck when you get back out on the golf course that I got while wearing it, but if it doesn't...it should make for a heck of a conversation piece with your golfing buddies. A good thing happened here in WGT land once more .